A.P.Noke is also one of the main peptide reagent providers around the world. 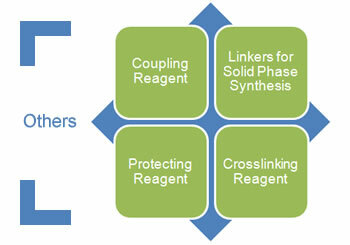 Apart from amino acids, we can surely cover most of coupling reagents, crosslinking reagents, linkers for solid phase synthesis as well as protecting reagents. Some of the reagents are not listed on our websites due to Exclusive Protection Agreement. For custom synthesis service, please feel free to contact us.